VIRGINIA INTERNATIONAL GATEWAY: Three new container stacks are coming online the week of May 14. 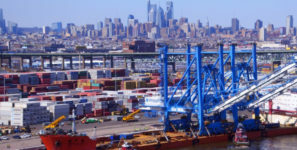 Port of Virginia saw cargo dip in April. Port of Virginia set to bring new terminal operating system online at VIG. A common terminal operating system will allow the expansion of POV’s motor carrier reservation system. The Port of Virginia is nearing the end of fiscal year 2018 and the total volume of TEUs, is 3.6 percent, or 83,000 units, ahead of where it was at this time last year. In April, the port processed 219,281 TEUs, which is a dip of 2.6 percent, or 5,900 fewer units when compared with last April. Cargo volumes at Virginia Inland Port (VIP) and Richmond Marine Terminal (RMT) were up 5.6 and 15.5 percent, respectively. Barge volume was up 6 percent, rail was off by five percent and truck volume declined slightly, down 1.7 percent. “We are showing modest growth for the fiscal year and we are still trying to reach consistency on a month-to-month basis as volumes are a somewhat unpredictable,” said John F. Reinhart, CEO and executive director of the Virginia Port Authority (VPA). “We expect volumes to increase, according to forecast, and remain steady as summer’s peak season nears. Our focus is on reliable delivery of service as we go forward in our capacity expansion projects at Norfolk International Terminals (NIT) and Virginia International Gateway (VIG). The port’s fiscal-year (July 1, 2017 – June 30, 2018) volumes continue to track ahead of last year: VIP volume is up nearly 4 percent; RMT, up nearly 17 percent; total barge traffic up 5.4 percent; truck volume up 6.6 percent; vehicle units down 7.2 percent; breakbulk tonnage up nearly 2 percent; and rail volume was stable. The N4 terminal operating system is already in use at NIT, Portsmouth Marine Terminal and Richmond Marine Terminal. Having a common terminal operating system will allow for the expansion of the port’s motor carrier reservation system and more data sharing via PRO-PASS, the port’s web-based hub for motor carrier resources and operational information. In addition, the port will begin introducing new capacity at VIG with three new container stacks coming online the week of May 14.